Finally a book for survivors written by a survivor! Got Parts? was written by a survivor of DID in association with her therapist and therapy group. This book is filled with successful coping techniques and strategies to enhance the day-to-day functioning of adult survivors of DID in relationships, work, parenting, self-confidence, and self-care. 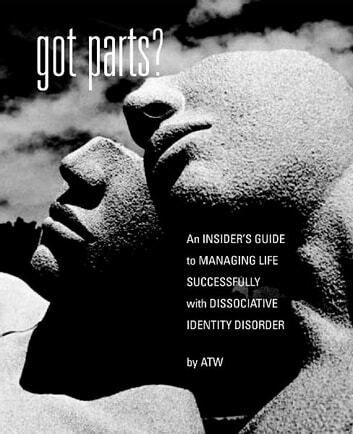 Got Parts will help you introduce yourself to your internal family and improve its communication, integration, and well-being. Although written to carefully avoid triggering, it delivers well-grounded guidelines for living that DID people need to do on the way to recovery. Coping strategies included help you with issues related to triggers, flashbacks, and body memories. Got Parts also includes a detailed list of outside resources you can draw on. This book is intended to be used in conjunction with a therapist and is not a substitute for therapy. Once thought of as a rare and mysterious psychiatric curiosity, Dissociative Identity Disorder (DID) is now understood to be a fairly common outcome of severe trauma in young children--most typically extreme and repeated physical, sexual, and/or emotional abuse, and often lack of attachment. Formerly called Multiple Personality Disorder, DID is a condition in which a person has two or more distinct identities or personality states that recurrently take control of the person's consciousness and behavior. Symptoms can include depression, mood swings, panic or anxiety attacks, substance abuse, memory loss, propensity for trances, sleep and eating disorders, distrust, detachment, lack of self-care, and distress or impairment at work. Livres similaires à Got Parts? A helpful read that I would greatly recommend to other systems.